Big Thompson Canyon is an extraordinary drive to Estes Park. 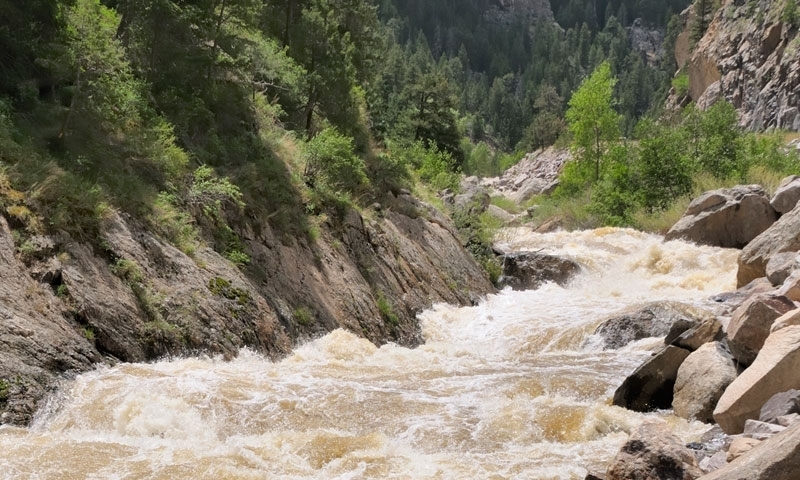 As one of Colorado’s most eminent scenic excursions, you’ll see the Big Thompson River and paramount rock formations. Why should I drive Big Thompson Canyon? On your way to Estes Park make a point of passing through this magnificent canyon. You’ll voyage through granite walls that tower thousands of feet in the air, and when the canyon widens you’ll see green mountainsides, and huge, old cottonwoods situated next to the Big Thompson River. The road was originally built to help Loveland merchants who needed a bypass through the mountains. In 1976 there was a huge flood through the canyon that killed over 100 residents and visitors. Some were never found. Now this two lane, paved road is built high above the river so it can withstand the rising waters. Where does the Big Thompson Canyon begin and end? Big Thompson Canyon goes from Estes Park to Loveland along US 34. How long does the Big Thompson Canyon take to drive? This 25-mile trip takes about 40 minutes to navigate one-way. Scenery: The most prominent detail of this drive is the scenery. You can stop at several rest areas to enjoy the river and the granite cliff walls. One large pull-off is situated about 12 miles outside of Estes Park. Fisherman/Kayakers: Anglers frequent the river’s side, and kayakers drop the rapids. There’s a put-in dock about 7.6 miles outside of Estes Park. Towns: You’ll stumble upon the towns of Glen Comfort and Drake, both with populations of about 200 people. Places to Stay: Countless cabin and cottage rentals scatter the river’s side. They’re a great place to stay overnight, so you can escape the crowds and find your peace and solitude. There are also several campgrounds, lodges, and bed & breakfasts as well. Wildlife: Keep your eyes open for hummingbirds, big horn sheep, deer, and elk. You might even see a mountain lion, bobcat, or bear. Shops: Pull off to stop into specialty shops like the Big Thompson Indian Village, Colorado Cherry Company, and the Dam Store. Extra Credit Canyon: Take a slight detour if you want to see more unreal rock formations. When you reach Drake you’ll be about 10.4 miles outside of Estes Park. Go north on C.R. 43. This curvy canyon takes you through Glen Haven, and the rock walls are unforgettable. Lush, green forest is visible everywhere the granite permits. You’ll arrive in Estes Park at the intersection of US 34 and MacGregor Ave.